Buy your tickets online and $4 per ticket will be donated to the ASIFA-Hollywood Animation Archive. To purchase tickets, please visit http://www.facebook.com/l/f11ce;www.gkids.tv/intheaters. Select "ASIFA HOLLYWOOD" from the green pull down menu at the top of the site labeled "select my school or organization,” then buy the tickets for whatever screening you’d like to attend." Kells screened in Cologne (Hometown of animation supervisor Fabian Erlinghauser who was in attendance ), Canada and London ! We had a great Q+A with Charles Solomon and the screening seems to have been very popular last night too. Amazing!!! I'm pretty sure this is the same technique that Donnachada Daly uses in his non glasses 3d images too..that weird magic eye effect. So it was'nt a crystal after all perhaps??? (PhysOrg.com) -- The Book of Kells and similarly illustrated manuscripts of seventh- and eighth-century England and Ireland are known for their entrancingly intricate artwork -- geometric designs so precise that in some places they contain lines less than half a millimeter apart and nearly perfectly reproduced in repeating patterns -- leading a later scholar to call them "works not of men, but of angels." The answer, says Cornell paleontologist John Cisne, may be in the eyes of the creators. The Celtic monks evidently trained their eyes to cross above the plane of the manuscript so they could visually superimpose side-by-side elements of a replicated pattern, and thereby, create 3-D images that magnified differences between the patterns up to 30 times. The monks could then refine any disparities by minimizing the apparent vertical depth of the images -- ultimately replicating the design element to submillimeter precision. Cisne proposed the idea in the July 17 issue of the journal Perception (Vol. 38, No. 7). The paper suggests that the technique, called free-fusion stereocomparison, which takes advantage of the brain's ability to perceive depth by integrating the slightly different views from each eye, was known nearly a thousand years before it was articulated by stereoscope inventor Sir George Wheatstone in the 19th century. Cisne analyzed the most detailed illuminated manuscripts of the Middle Ages, created between 670 and 800 A.D., including the Book of Kells (circa 800 A.D.); some have as many as 30 lines per centimeter. Detail of folio 85v of "The Book of Durrow"The artists stayed mum about their techniques, possibly because their talent gave their Celtic church an edge over the Roman church in the competition for disciples. "If you're in the middle of a propaganda war, [it helps] if the angels are clearly on your side," Cisne said. But they left a few clues, he said, including the high degree of symmetry and repetition among many of the most intricate patterns and the elements' spacing, which is usually at about the distance between an average person's pupils. "It turns out that if you can draw accurately enough, you can easily get a magnification of the lateral [horizontal] distance something like 10, 20 or 30 times -- about the magnification you could get under a dissecting microscope," Cisne said. Really amazed by this expo, very well organised, and so many animation superstars walking around here! I was sorry I had'nt brought any of the comics with me, and then I met Niklas Anderson master layout dude who worked with us on Kells and he said he saw them for sale in the expo. I walked around and there was actually a big pile of both volumes at Stuart Ngs table. Amazing! He got them in France. Hope we can get an english language publisher around the time of the release here next year. To all our American Friends...please spread the word! Just a couple of thank yous to Pam Koller and Jamie Bolio and all the other friends of the film out here in L.A. who have been helping to spread the word on Kells thru the animation community. They are linking in with Asifa and working with our distributors to help make sure people get to see Kells here in the AMC in Burbank when it does its qualifying run . Hopefully that will get a positive buzz going for the release next year as well. In Dreamworks amazing campus yesterday I was flicking thru Variety and saw a picture of Aisling and Brendan at the waterfall in there. Which was a bit surreal. Mentioned in an article about the 20 qualifying features this year. So many great films, hard to believe that theres two handdrawn feature in the running, four stop motion and such exceptional CG entries , when we began production on Kells traditional animation seemed resigned to TV specials for stop mo and tv series for hand drawn . So its interesting at least to see life in the old dogs yet, however it would be a really great day when the technique was not seen as remarkable and it was excepted that some stories simply suit being told in different techniques. Anyway , the other mad Kells related thing that happened yesterday is that Pauls brother in London texted to say he saw Aisling posters on the side of London buses!! She is the kind of mascot for the London Childrens Film Festival this year! So even two years almost after we finished productin we still seeing the film creeping out into the world in all sorts of unexpected ways. Paul and I are out here in LA for a week. Kells is screening at the CTN expo and we are doing a Q+A with Charles Solomon. Anyway I'm all jetlagged and will now try and get some sleep before morning rolls around here again! Just letting folks know that we are planning a Saloon shop on our site to sell DVDs (signed by me with original sketches by myself) , books, etcetera. Please leave a comment if think you would be interested...good to get an idea of how many to stock up on. Andrew Murray one of our summer interns took some of the original art from Kells back with him for a display in his college. Here it is in Situ. It is some animation by David Bols in Belgium from the goose chase, Posing by Barry Reynolds, bg layout by Niklas Anderson and an x-sheet! Please vote for THE SECRET OF KELLS in the Indie Wire animated feature poll. When you have finished voting, please forward this by email to everyone you know. The Oscar animated feature race is getting crowded, with an old-school handdrawn toon ("The Secret of Kells") and a Spanish-made CG talking-critter movie ("The Missing Lynx") pushing the category over the 16-film submission threshold needed to support five nominations. GKIDS picked up U.S. rights to "The Secret of Kells" just three days before the Oscar submission deadline and plans to open the 2D toon for a one-week qualifying run on Dec. 4 at the AMC Burbank 8 in Los Angeles, followed by a wider release in March 2010. The story of a ninth-century boy who rebels against his guardian's orders and helps to illuminate a famous Irish manuscript, pic garnered numerous accolades abroad, including an audience award at the Annecy toon fest and a nomination for the European Film Awards' animated feature prize. GKIDS is a for-profit offshoot of the New York International Children's Film Festival focused on distributing quality family-oriented films programmed at the annual kidpic showcase. "GKIDS came along organically as (the organizers) and filmmakers coming to the festival felt that some really wonderful films were not being distributed in the U.S.," GKIDS prexy and NYICFF co-director Eric Beckman said. NYICFF hosted the U.S. premiere of "The Secret of Kells" at a special event last summer. 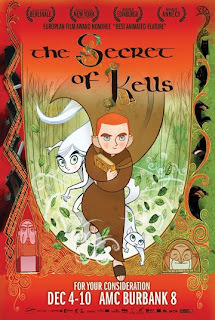 "The Secret of Kells" was directed by Tomm Moore and backed by French-Belgian-Irish co-producers Les Armateurs, Viva Film, Cartoon Saloon and France 2 Cinema. The U.S. distribution deal was negotiated by Celluloid Dreams, who are also handling international sales, after an earlier domestic license with Empire Film Group fell through. GKIDS also has French-Italian co-production "Mia and the Magoo" (another EFA animated feature nominee) in the pipeline, though the company plans to prepare an English-language dub before releasing in 2010. As for "The Missing Lynx," the CG toon completed its Oscar qualifying run last Thursday, playing seven days on a single screen in Encino, Calif. The story of an endangered feline trying to evade a big-game hunter, pic is being distributed in North America by Phase 4 and was produced by Kandor Moon in Granada, Spain, with the roles originally performed in English and later dubbed into Spanish. They have great films like Azur and Asmar, Mia and the Migou and Sita Sings the Blues on their books and we are very happy to be working with them. They plan a US release next year around St.Patricks day with a few screenings leading up to that starting in the new year. They have also put Kells in for an Oscar run this year. Its a crazy competitive year with so many great animated features eligible this year we know a nomination is a long shot but we thought we might as well go for it any way. Back in the Kingdom, where I was married many moons past. Lovely intimate festival, had a packed screening today with loads of enthusastic school kids and also a lecture in the Tralee IT. After screening the film all over the world this year , its great to show it to Irish kids again, but the questions and observations are often very similar no matter what country we show it in! Plenty of impressive short films on show here , lots of films made on tiny budgets but with impressive results.